Cute Carol Wig. Made of 100% Joyokalon .. this is layered with a tapered back. This has a wide 4" skin top .. wavy hair. Looks very similar to Stockard Channing and Vanessa Hudgens .. Rizzo from Grease. This is a top quality wig. The cap is adjustable to fit the average to average/larger head. 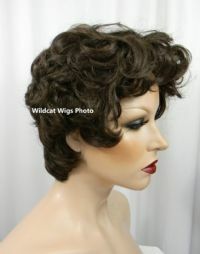 This is for the chestnut brown wig which is usually in stock and ready to ship. ALL SALES ARE FINAL WITH NO EXCEPTIONS FOR HEALTH REASONS.